Wikimedia Commons has media related to Flags of Chinese Taipei. The National Flag Anthem of the Republic of China, also unofficially known as the "National Banner Song", is a patriotic song typically played during the raising and lowering of the flag of the Republic of China, commonly known as Taiwan. It is also played at international sporting events such as the World Baseball Classic and Olympic Games, where Taiwan participates officially under the name of Chinese Taipei. The song is thus considered to be in effect a secondary national anthem; Taiwanese citizens stand when it is performed and salute it as they would salute the national anthem. 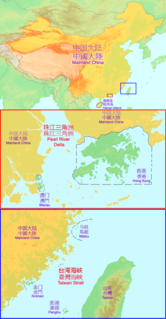 "Taiwan, China", "Taiwan, Province of China", or "Taiwan Province, China" are a set of politically controversial and potentially ambiguous terms that characterize Taiwan and its associated territories as a province or territory of "China". The term "Taiwan, China" is used by Chinese media whenever Taiwan is referenced. In English, "China" is inserted after "Taiwan" by adding ", China", per English grammar rules. In the Chinese language, however, the Chinese characters 中國 ("China") would be inserted in front of "台灣" (Taiwan) per Chinese convention to indicate a country and its subdivisions. For example, the word "China" would be inserted into video captions on television, whenever a person mentions the word "Taiwan" but the characters 中國 ("China") would be inserted in front of "Taiwan" (台灣) despite the fact that the person never said the word "China", to propagandize to the audience that Taiwan is part of China. The term "Taiwan, Province of China" also sometimes appears in the drop-down menu of websites and computer software that show a list of ISO 3166-1 country names. Due to the political status of Taiwan, the Republic of China (ROC) competed as Chinese Taipei at the 2002 Winter Olympics in Salt Lake City, United States. The International Olympic Committee mandates that the Chinese Taipei Olympic Committee flag is used, and not the flag of the Republic of China. In the People's Republic of China (PRC), the team is known as Zhongguo Taibei (中国台北队) or, Taipei, China, where China implies the PRC. Due to the political status of Taiwan, the Republic of China (ROC) competed as Chinese Taipei at the 1998 Winter Olympics in Nagano, Japan. The International Olympic Committee mandates that the Chinese Taipei Olympic Committee flag is used, and not the flag of the Republic of China. In the People's Republic of China (PRC), the team is known as Zhongguo Taibei (中国台北队) or, Taipei, China, where China implies the PRC. Due to the political status of Taiwan, the Republic of China (ROC) competed as Chinese Taipei at the 1994 Winter Olympics in Lillehammer, Norway. The International Olympic Committee mandates that the Chinese Taipei Olympic Committee flag is used, and not the flag of the Republic of China. In the People's Republic of China (PRC), the team is known as Zhongguo Taibei (中国台北队) or, Taipei, China, where China implies the PRC. China's doing so violates a treaty signed by both countries, Taiwan and China, in which the agreement states that the official name for Taiwan in sporting events is "Chinese Taipei" (中華台北) and not "Taipei, China" (中國台北). Due to the political status of Taiwan, the Republic of China (ROC) competed as Chinese Taipei at the 1992 Winter Olympics in Albertville, France. The International Olympic Committee mandates that the Chinese Taipei Olympic Committee flag is used, and not the flag of the Republic of China. In the People's Republic of China (PRC), the team is known as Zhongguo Taibei (中国台北队) or, Taipei, China, where China implies the PRC. Due to the political status of Taiwan, the Republic of China (ROC) competed as Chinese Taipei at the 1988 Winter Olympics in Calgary, Alberta, Canada. The International Olympic Committee mandates that the Chinese Taipei Olympic Committee flag is used, and not the flag of the Republic of China. In the People's Republic of China (PRC), the team is known as Zhongguo Taibei (中国台北队) or, Taipei, China, where China implies the PRC. 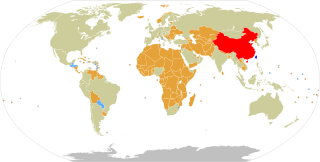 The Republic of China currently competes as "Chinese Taipei" at the Olympic Games. The ROC first participated at the Summer Olympic Games in 1932. After the Chinese Civil War the ROC retreated to the island of Taiwan and only Taiwan-based athletes have competed in its team since then. The ROC boycotted the Olympics starting from the 1976 Summer Games until it returned to the 1984 Winter Games, and started participating as Chinese Taipei. The Republic of China (ROC) participated in its first Summer Olympics in 1932 under the name of "China". 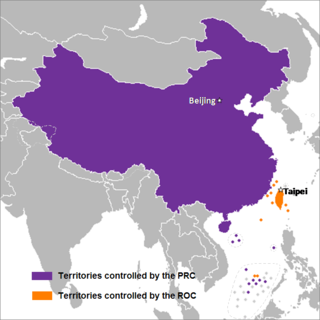 After the Chinese Civil War the ROC retreated to the island of Taiwan, and only Taiwan-based athletes have competed on behalf of the country since then. The ROC protested the 1979 Nagoya Resolution by boycotting the 1976 Summer Olympics; this continued until the ROC competed under the deliberately ambiguous name "Chinese Taipei" in the 1984 Winter Olympics. China also took part in the Opening Ceremony of the 1924 Summer Olympics, but its four athletes withdrew from competition. The Chinese Taipei Olympic Committee is the National Olympic Committee representing the Republic of China (Taiwan). The Chinese Taipei Olympic flag is used by the Republic of China (ROC) team, which competes under the title "Chinese Taipei" during the Olympic Games and other events, in place of the flag of the Republic of China. 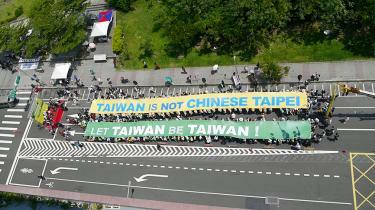 This is a result of the complex Cross-Strait relations between the Republic of China and the People's Republic of China. The Olympic flag has been in use since 1980, following the decision by the International Olympic Committee that the ROC could not compete under the country's name or flag. Beer in Taiwan was dominated by monopoly products until 2002, when free trade became law in Taiwan. The main domestic brand remains Taiwan Beer, brewed by the publicly owned Taiwan Tobacco and Liquor Corporation that succeeded the government's monopoly bureau in 2002. Taiwan Beer is primarily sold domestically, though the brewery does make some beer for export to Taiwanese living abroad. In recent years Taiwan Beer has stepped up export to People's Republic of China. Other products such as Zhujiang Beer are also popular. The 2017 Summer Universiade, the XXIX Summer Universiade, commonly known as the Taipei 2017 Universiade, took place in Taipei, Chinese Taipei from 19 August to 30 August 2017.